Do You Really Know How to Clean Your Countertops? You Might Be Surprised! What is one of the largest investments you can make in a home? The countertops, of course! It’s important to make sure that these duly functional and decorative units not only function properly for you but also look nice in your home, too! You can retain their value, beauty, and function by taking proper care of them; however, not all countertops are created as equals. Some do very well with abrasive cleaning while others don’t, and it’s important to know what type of countertops you have and how you should clean them. We’ve highlighted the 5 main types of countertops and how you should clean them below. Take a look at our helpful hints! Stainless Steel – Most common in commercial kitchens, the stainless steel countertops are known to be super tough and great with heat and are becoming more and more popular in residential kitchens. While they are easy to maintain, they can be dented and scratched easily, and they show fingerprints and water spots as well. How to clean stainless steel – For dry cleaning, wipe down the countertop with a microfiber cloth. For wet cleaning, a soft cloth and a little mild dish soap is all you need. Want to do tougher cleaning? Break out a mild abrasive, rinse the surface, and dry it thoroughly with a clean, soft, dry towel. Slate – A gorgeous material full of rich blues and greens and great texture of stone, slate is heat-resistant and gorgeous. Unfortunately, it can be quite expensive and can crack and chip away somewhat easily, so it’s imperative that you take proper care of your slate countertops. How to clean slate – Dust these countertops once a week with a microfiber cloth. Clean them with a damp cloth and a pH neutral stone cleaner as well. Laminate – These are the most common countertops that you are more than likely to encounter in the average home. Made from layers of paper and plastic and laminated together to form the surface, laminate countertops hold up well to everything a person puts it through, resists scratches and spills, and comes in a variety of colors and finishes. These easy-to-clean countertops are incredibly forgiving; however, if they are damaged, it’s nearly impossible to repair them. How to clean laminate – Use a clean cloth, a mild dish soap, and water to clean this countertop. Dry it after washing in order to stop water from pooling in the seams and creating water damage. Marble – An incredibly beautiful and durable stone surface, marble countertops can typically be found in certain areas of the kitchen such as bars, islands, and baking areas. Bakers prefer marble because of the ease of rolling out the dough and pastries on its surface. A gorgeous update to any kitchen, marble is soft and tolerant of hot surfaces, but it is much more susceptible to scratches, pitting, cracks, and stains. How to clean marble – Dust your marble countertops at least once a week with a soft microfiber cloth. Use a damp cloth and a pH neutral cleaner for stone when you wet clean these countertops. It is imperative that you do NOT use regular cleaning products as they can etch the stone’s surface in time, and never use abrasive cleaners. Be very careful with acidic foods such as tomatoes, citrus fruits, and vinegar on marble. Remember, marble is a delicate surface, so treat it with great care! Granite – Perhaps every homeowner’s dream, granite is super tough stone that is formed from volcanic magma, earning it a reputation as a fantastic building stone. Granite is available in a myriad of colors and is also incredibly durable and heat-resistant, making it perfect for kneading dough. On the flip side, granite requires a regular care aside from just cleaning. You’ll have to make sure that it is sealed periodically, and stains can be relatively difficult to remove. How to clean granite – Use a microfiber cloth to dust off the surface of your beautiful granite countertops. Wipe it down every day and as needed by using water. Once a week, wipe it down with a damp cloth and a stone cleaner that has been formulated with a neutral pH. Never use harsh chemicals or abrasive cleaners as they can harm your countertops. Remember, it matters what kind of cloth you use to clean your countertops and the other surfaces present in your home. We provide cloths and towels for every type of clean-up job you could possibly think of! View all of our top-notch products on our website at www.uswiping.com to get started today and make your countertops the envy of all your neighbors, family, and friends! 10 Easy Ways to Go Green in Your Home! Create a greener, cleaner nest to live in! Going green in your home isn’t as challenging as you might think – or as costly. Making your home more environmental-friendly is wise for the earth, your budget, and, of course, your health. Try these small changes to make a huge difference! 1. Chill Out – Adjust how you cool your home during the spring and summer months. If your thermostat is programmable, set it to cool at a warmer temperature while you are at work. Closing the shades helps to keep heat out and decrease the amount of cooling needed. Think also about turning the air conditioning completely off and only running it when you are home. You’ll save both energy and money! If the weather is nice enough, open the windows and enjoy the natural breeze and fresh air. Also, make use of those ceiling fans before you resort to turning on the air conditioning. 2. Light Right – Switch to eco-friendly florescent light bulbs. They aren’t much more expensive than other light bulbs, but they usually last much longer and cost far less to power! When they burn out, dispose of them at a recycling center. During the day, soak up the natural light by opening your blinds. On sunny summer days, you won’t even need to flip the light switch on! 3. Waste No Water – Take shorter showers and remember to turn off the water when you’re brushing your teeth or while shaving. Outside, use a pool cover when the pool isn’t in use. This keeps the water cleaner so less filtration or chemicals are needed. It also prevents the water from evaporating from the pool and needing to be refilled. 4. Turn It Off – Switch off the lights when you leave a room. The same goes for the television. When you put your computer away for the day, turn it completely off. Even when it’s in “sleep mode,” it’s still using energy. Unplug unused appliances and chargers, too. Save some money on that electrical bill! 5. Go Paperless – Don’t waste paper when it isn’t necessary. One easy way is to start paying your bills online. It is way more convenient – and green! Try to print only things that must be printed and use both sides. Remember to recycle it afterwards instead of throwing it in the waste bin. 6. 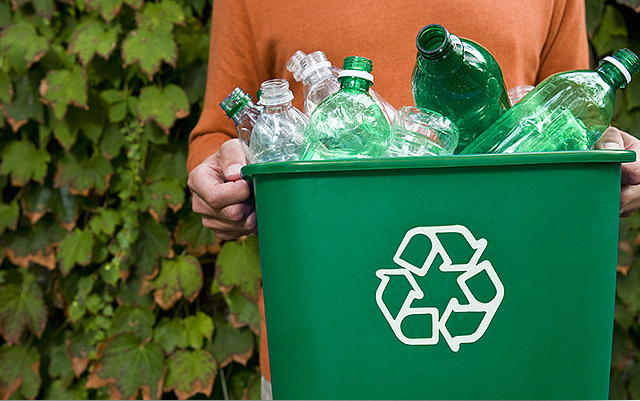 Recycle, Recycle, Recycle – Before throwing anything away, ask yourself if it can be recycled! If you aren’t sure, look it up. Most things can be recycled curbside at your home. Make a recycling sorting center for your family to put plastics, glass, and paper accordingly. It will be something you can feel good about and will become a habit in no time! For things like electronics and batteries, drop them off at your local recycling centers. 7. Eat Fresh – If your yard has room for a garden, think about planting your own vegetables or a simple herb garden. It’s a fun and easy way to make your meals greener and more delicious! With the warm months ahead, visit your local farmers market to buy your groceries. You can find fresh produce like just-picked berries that likely were grown with fewer chemicals. Explore all the fun fruits and veggies that are in season! 8. Clean Green- Make your own household cleaners instead of spending money on chemical products from the store. Use plain white vinegar in a spray bottle to clean your countertops. Baking soda can be used instead of bleach to clean the bathroom tub, toilet, and sink. One of the best perks of green cleaning is that it’s nontoxic, so it’s safe for humans and pets! 9. Drink Responsibly – Drink from a reusable water bottle and stop buying plastic disposable water bottles. If filtration is important to you, there are water bottles that have built-in filtration systems or purchase a filtering pitcher to easily fill up your water bottle or a glass at home. It might seem like a hassle at first, but you’ll make a huge impact! 10. Switch to Reusable – When having dinner, use cloth napkins instead of paper napkins. Also, choose a reusable rag over disposable paper towels. At U.S. Wiping, we have plenty of reusable option to choose from, including rags, towels, napkins, and more. You can check out the entire selection at www.uswiping.com. A cleaner world can start right in your home! Call us at (314) 421-3311 or (800) 279-2051 to get started today!